Both sides go into the game with new managers at the helm with Moyes and Pellegrini. Both teams are currently outside the top three after picking up seven points from Their opening four matches, but this weekend's derby offers a chance for both managers to make a major statement of intent after securing midweek Champions League success. For City, they enter the match not only looking to take points from Their rival but also to set right an inconsistent start to the season. After a dominant 4-0 victory over Newcastle to start the season, City lost 3-2 to Cardiff before skipping past Hull City 2-0 in a hard-fought match and drawing 0-0 with Stoke City. For United, Sunday's match Represents another chance for Their new-look strike force to gel. Last weekend saw Wayne Rooney recover from a head injury to play his part in a supporting striker's role behind Robin van Persie. The Englishman scored a fantastic free-kick and his overall performance received rave reviews. Moyes' confidence in his temperamental striker finally seems to have paid off, with Rooney now looking sharp in the box. As is with all the big matches, this contest Should be closely contested in the midfield. "The midfield battle" is a real theory now, and both teams go into the match quite settled in their midfield formations with the addition of new players. Sergio Aguero has been forever immortalized in City history for his last-gasp goal that won them the title in 2012, and he has produced world class moments on several occasions, and scored a fantastic winner in the derby at Old Trafford in April. He drifted past the United defense pretty easily before firing the ball past the United goalie David de Gea. Dzeko has more space this season than last. Balotelli is leave so, we all know that Dzeko can score to United cos he do it before. One of the defenders he sprinted past in the derby back in April was Ferdinand, who will be keen to make amends in this weekend's fixture. Vidic will need to be at his best to halt Aguero, who is the key to City's attacking play. But the task of breaking down a United defense that has conceded only two top flight goals this season, Should Be demanding for Dzeko and the rest of the striking force of City. Fernandinho has the tough task of keeping in-form Wayne Rooney quiet this weekend. The Brazilian will be expected to drop deep and mark United's point guard to prevent him working his magic in City's side of the pitch. It's a big task for the 28-year-old City defensive midfielder, but these are the matches precisely why City splashed out £ 30m for his services. Rooney scored twice in this fixture last season and against Leverkusen in the Champions League midweek and they should not be surprised if he does the same this weekend. New United signing Marouane Fellaini can make himself an instant hero amongst the Red Devils' faithful by containing his City counterpart Yaya Toure. Manchester City's midfield man has been superb so far this season, scoring three goals from five matches of the campaign, and now has sea space on the field to venture forward thanks to the acquisition of Fernandinho. City unquestionably look a much faster, sharper and more dynamic outfit when the Ivorian Toure is given a free role to run forward and help partner attacks with the strikers, as he did in the second half in midweek against Viktoria Plzen in the Champions League, with Fernandinho operating deeper. United's victory over Leverkusen also saw the full debut of Marouane Fellaini, Whose towering presence and timely tackles released pressure off Michael Carrick and will be instrumental in Sunday's play. This midfield battle Should provide us with some attritional moments on the pitch. Aside from last weekend's lifeless performance at the Britannia against Stoke City's main problem has been in defense. With Vincent Kompany out injured for the first four Premier League matches of the season, Pellegrini was forced to deploy center-back combinations including Lescott, Garcia and Matija Natasic. The return of captain Kompany from groin injury in midweek gave them a much needed boost. He will be fit for Sunday, Which he describes as a special game in the Premier League calendar. His task will be to contain the daunting presence of Robin van Persie, who has been in excellent form. He has spearheaded the United attack, even without Rooney at times and has been highly influential in United's victories. The Dutchman, who finished as last season's Premier League top scorer, currently has six goals from as many matches and will be determined to help United secure another memorable win at the Etihad Stadium. 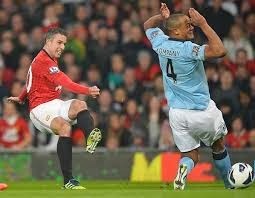 Standing in his way will be Vincent Kompany, who will be hoping to get the better of this battle with van Persie.